Came across this interesting audible interpretation of data from CNNMoney.com featured on Fast Company’s 23 Best Infographics of 2011 feature. 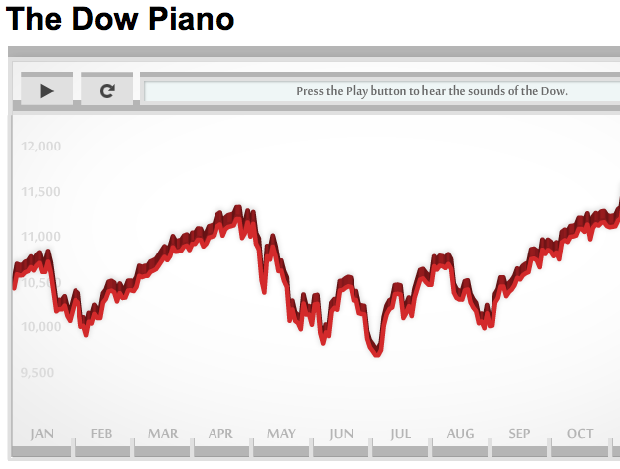 You can hear how the stock market sounded in 2010. Why not use all the senses to understand data? It would be interesting to layer in a comparison set of data and hear how they interact. What we’d like to see next: odor graphics. A market graph that stinks when it sinks. I’ve had my head down lately, working hard on a number of projects, so I haven’t done much posting to the blog, but this put a smile on my face so I knew I had to share it. Alexander Chen, Creative Director at Google Creative Lab, put this together back in 2011, but I just discovered it today. It’s an interactive visualization of the Prelude from Bach’s Cello Suite No. 1 – one of my favorite pieces of music. Here’s a video of it. You can also play with the interactive version and tangle yourself up in the strings a little. Strings: J.S. Bach – Cello Suite No. 1 – Prelude from Alexander Chen on Vimeo. Thanks to Jon Schwabisch for mentioning Alexander’s site and making me smile.